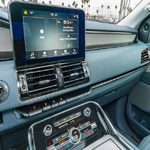 These days, vehicles need to have features that cater to the modern connected driver. Lincoln has gone above and beyond with the new Navigator. You can get popular full-sized SUV with some great features that keep your devices powered up throughout your drive. When you step inside the Lincoln Navigator at Fox Grand Traverse Lincoln you'll notice that there are a lot of charging ports available. You can get up to six fast-charging USB ports, four 12-volt ports, and a dedicated 110-volt outlet. These outlets are more than enough to keep your family's mobile devices and computers powered. Best of all, these ports are spread out throughout the cabin. All three rows of seats have access to them. In the front, drivers in Traverse City can also get a wireless charger. The center console has a small media bin. Inside, you'll find a couple of USB ports and the wireless charging pad. Simply place your phone in the bin and let it charge up.